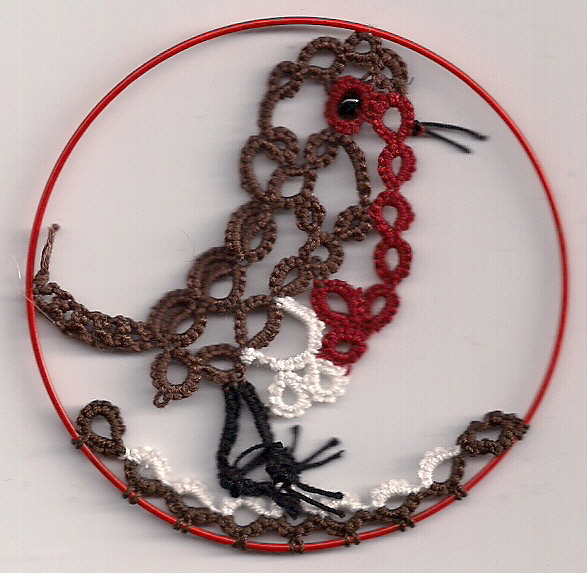 Just over a year ago I posted this robin but found it rather a fiddle to make, ever up to the challenge Jane designed another one and took it to the Palmetto Tat Days. As I was so happy with the result I immediately started a production line of them, but all of a sudden the eyes became a problem and I stopped making them and so bits of robins languish in a bag ready and waiting for the day when I will have enough confidence and time to finish them. This robin now lives in Canada, he flew over there last year. A little bird also tells me that the pattern will soon be available to everyone. 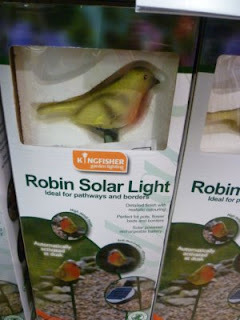 Whilst shopping today I found an instant way to get a robin in your garden! Made by Kingfisher?! It is Tuesday, named I believe by Isdihara as "Tatting Tea Tuesday" so in honour of her I took a photo of this bag of tea. Hopefully later on today I will get a chance to sit down and tat with a cup of tea. If you would like to win a tatted cup then go over to Wendy at this blog for a chance to win one. On Sunday night because there were so few in church I took the service of Compline the ancient form of night prayer, in it are these words "Keep me as the apple of the eye, hide me under the shadow of thy wings" taken from Psalm 17, beautiful words as the night closes in around us and we feel protected. The words also reminded me of the apple that "I'm in the garage" has now begun to make shuttles from, the wood comes from my father's apple trees and so is very special to Jane and myself. Although as the branch was only cut in the Summer it was put into a special solution to hasten the drying process and this is the result. Just look at that grain. We say that someone is the apple of our eye, meaning that they are special and much loved. The saying originally meant the central aperture of the eye, the pupil, presumably because apples were the most common sphere-shaped object around at that time. However, the Hebrew translation is little man of the eye, meaning the reflection of someone seen in a pupil so although I am no scholar, it would appear that when the King James bible was translated in 1611, exactly 400 years ago it acquired the word apple. If you want to see what a pop-a-bobbin shuttle looks like in apple then go to Martha's blog, these are the only two to have been made so far and I think at the moment they are the "apple of my eye!" It is one of those days, a day full of ones! I love it when that happens it makes the day seem so special, and it is a special day for some one as I announce who has won the caption competition! So therefore I am pleased to say that crysta.westoby gave the winning caption as judged my by son in Singapore and here it is. 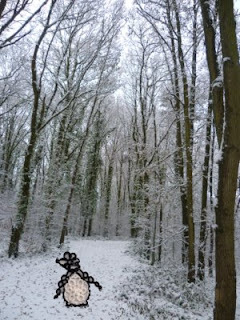 So no it was obviously not to late Crysta for a winter wonderland! 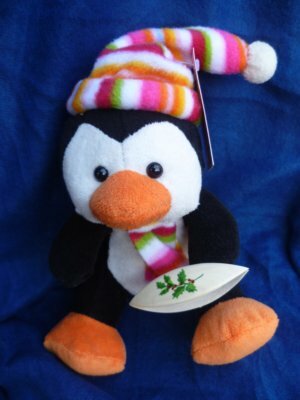 Congratulations and please can you e.mail me at popabobbinshuttle@gmail.com with your address and then I can send the penguin and shuttle to you. Thank you to all the entries, they were all great and I am really glad it was not me who had to choose the winner. I managed to get Jane's new handkerchief edging finished although she only put the pattern on her pattern page yesterday. Obviously I am not that quick to complete it in a day, but asked to have a go at it before publication, one of the perks of having a sister who is a great designer! It really is easy and quick to make but so pretty, the thread I used was DMC 80 in bright pink together with a variegated colour. 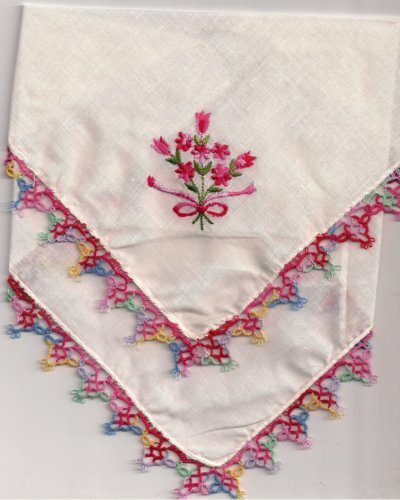 The handkerchief was a bit of a challenge, as it is not very even, but the finished result is so pretty. Today is the feast of Epiphany when we remember the three kings traveling to see the Christ child and offering gifts of Gold, Frankincense and Myrrh. I have three sets of items to show you, only they were not all gifts, unless you can call some of them gifts to myself! Sue Anna sent me this selection of HDT, bobbins and beads and 'Im in the garage' some wood, but sorry you can't see that as he has put them away in a safe place. This is most generous and Sue Anna and she is most appreciative of the shuttles that are being made by 'Im in the garage". The after Christmas sales meant that there were some baubles reduced in price and looking very lonely on the shelves. The colours may be a bit dark but I am sure when they are covered with tatting they will look very different. The last of the three gifts are some Lizbeth threads, Jane and I ordered a batch of them from the USA, she bought loads more than me!! But sadly the customs people charged us for the privilege. With all these beautiful threads I now have in my possession, would you believe I dug out an old white Coats ball of thread and covered one of the black baubles? Notice I did not even add a bead. It is a bit like a child in a sweet shop at the moment there are so many lovely things to choose from but I don't know where to start! Jane will be putting five pop-a-bobbin shuttles into her shop on Saturday, there will be no post ones this time. However, if you want to win one of those, then please enter the caption competition that was in my previous post, there is one more day until it is closed. Thank you to all who have so far entered, they are all very clever. I thought I would begin 2011 with a competition/challenge/giveaway all in one, especially as some of us are experiencing a very bad Winter with lots of snow. 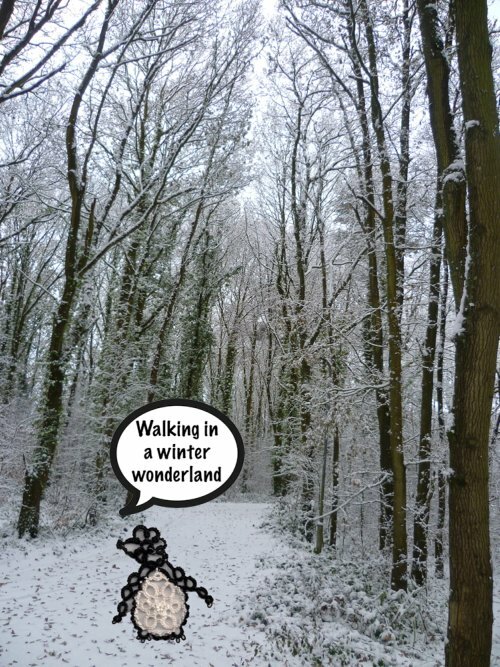 This picture was taken in the village where I live and so I made Jane's penguin and superimposed it. 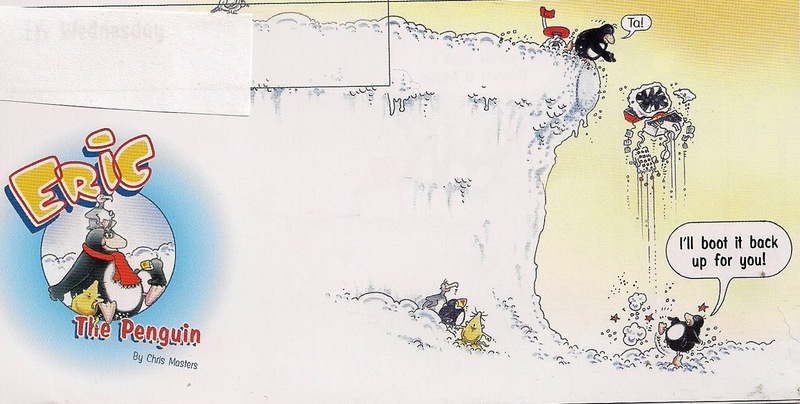 What I am asking you to do is to write a caption for this little fellow standing in the snow and you can even name him/her if you wish. To make it fair I will not be the judge, instead I will get somebody quite independent who doesn't know any of you in blog land! Also you have up until the 8th January to take part, the winner will be announced a few days later as I will have to give my judge suitable time to choose the best caption. 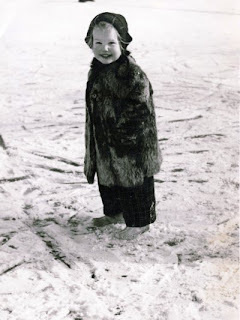 This picture was taken by a local newspaper photographer when I was very small, and the caption read "Orphan of the Storm". My parents had left me whilst they went skating, from what I have been told. 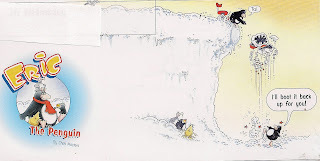 Your caption doesn't have to be that short, only please don't make it too long, short and snappy is often the best. 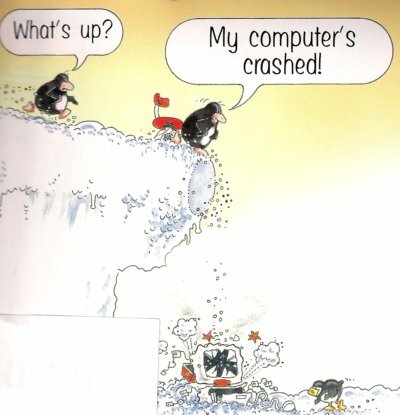 So good luck and to get you into a penguin mood this is a calendar designed by the cartoonist Chris Masters of Eric the penguin fame, and it hangs in the garage to remind 'Im in there' that the temperature is very low at the moment, in fact just right for penguins! Before I waddle off just thought you might like to know what the strange looking object in my last post is going to be used for, thanks to those who tried to guess, some of the answers were hilarious. Well as you can see it is a cuff link holder, that fooled you!